Is the daily grind getting to you? Are you in desperate need of cheering up? We all have sad days from time to time. I can wake up feeling low and have absolutely no idea why. I don’t want to leave the house or see anybody, I actually just want to wallow in my own misery. Bouts of sadness like this can take their toll. They are known to have a negative affect on the body, causing headaches, sore joints, and problems with the immune system. People who are sad are also more likely to eat junk food, which can have a negative impact on your health. Luckily, there is a way to turn this around. I know it’s difficult when you are sad, but smiling has so many benefits and I have something to make this easier. When we smile we activate the release of many chemicals. Here is a breakdown. Neuropeptides These are tiny molecules that get working straightaway to help fight off stress. Dopamine This chemical helps to tackle your bad mood and also keeps you calm and focused. Endorphins Not only making you feel great, endorphins also act as a natural pain reliever. Serotonin This chemical is known to affect mood balance, appetite, sleep, memory, and social behaviour. So what’s not to smile about? Smiling is contagious, even in the worst situations if someone smiles at us we have a natural instinct to smile back. Smiling will also make you seem more approachable and trustworthy. If somebody needs help a frown is likely to put them off. When I am sad, as in most situations I turn to music. There’s nothing like an impromptu dance around your bedroom to brighten up your day. 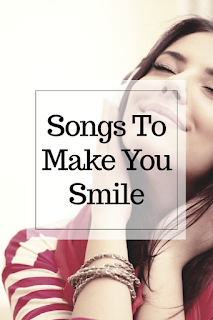 I put together this awesome playlist which is guaranteed to turn that frown upside down. For those of you that don’t have Spotify, here is a full track list. As you can see there are a few unusual choices. I thought it was important to for the playlist to reflect my personality, which can be a little unusual at times. If you enjoyed this playlist, please check out my ultimate relaxation playlist. Great songs. It will be even better to put clickable links so taht we can click on songs from your post! Hi, there are 2 clickable links to the playlist.